Welcome to THE STORY OF THE SOMME podcast series, which tells the story of the Somme Offensive in the words of those fighting on the Western Front and their families back home. The series was commissioned by the DEPARTMENT FOR DIGITAL, CULTURE, MEDIA AND SPORT and developed in partnership with the FIRST WORLD WAR CENTENARY BATTLEFIELD TOURS PROGRAMME and CHROMERADIO. It was first released to accompany the SOMME100 VIGIL at Westminster Abbey, held through the night of 30 June/1 July 2016 to mark the centenary of the opening of the Battle of the Somme. 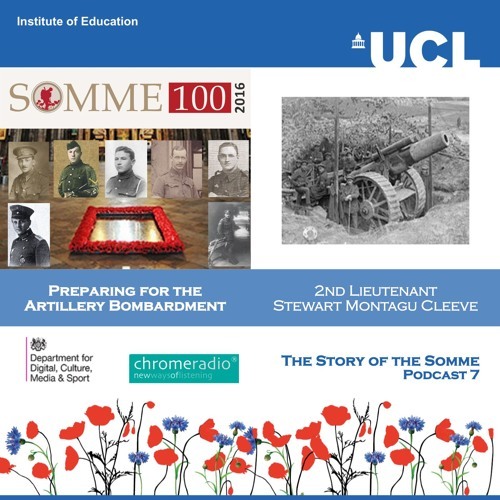 In this podcast, 2ND LIEUTENANT STEWART MONTAGU CLEEVE recalls preparing for the artillery bombardment in June 1916 before the Battle of the Somme. Stewart Montagu Cleeve was born to a military family in Hampshire in 1894. He attended the Royal Military Academy at Woolwich before being commissioned into 36th Siege Battery, Royal Garrison Artillery. SOURCES | Source: Forgotten Voices of the Somme, Joshua Levine, page 90 For biog, see obituary: http://www.independent.co.uk/news/people/obituary-lt-col-montagu-cleeve-1478794.html PRODUCTION | ChromeRadio for the DEPARTMENT FOR DIGITAL, CULTURE, MEDIA AND SPORT | Producer - Catriona Oliphant | Narrator - Nicholas Rowe | Reader - Tijana Uludag-Whyte, Heartlands High School | The Last Post played by LSgt Stuart Laing, Welsh Guards on a First World War bugle.